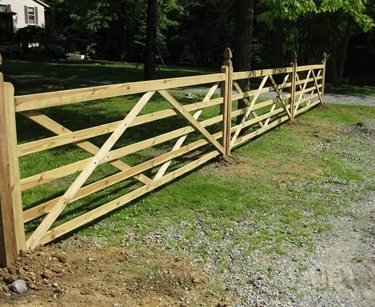 Whitewashed wood split rail fence is the traditional look for equestrian homesites, but this material is rife with problems and high maintenance. From the need to repaint periodically is time consuming and expensive. Some horses actually eat (cribbing) the fence, which not only destroys it, this can cause serious health problems for the animal. 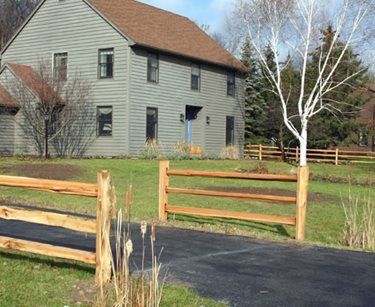 The introduction of vinyl fencing solved all these problems and more, to provide a weather resistant alternative to wood for creating this classic horse farm style. 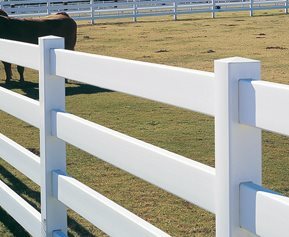 This white Crossbuck rail fence design is super for the smaller ranchette where white fencing is ideal for defining property limits, horse corrals or other enclosures. Strongly graphic and maintenance free, it is manufactured by Certainteed, which strives to provide vinyl fences for New England and northern climates that stands up to time and weather. This western red cedar stack fence by Hoover Fence is America's most historic look for large properties and vintage homesites. 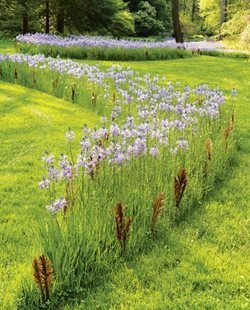 Often know as a Virginia fence, the zig zag construction does not require fence posts so it is a problem solver that can be erected just about anywhere, even on solid bedrock. 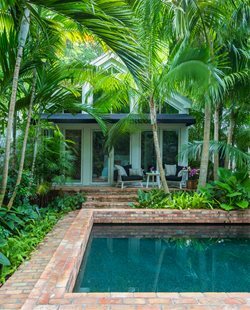 This is a great choice for homes with history, a cabin or to create a fence that blends nicely into the countryside. To define boundaries, enclose livestock or simply to suggest the limits of a yard, this hand split western red cedar fence has no equal. 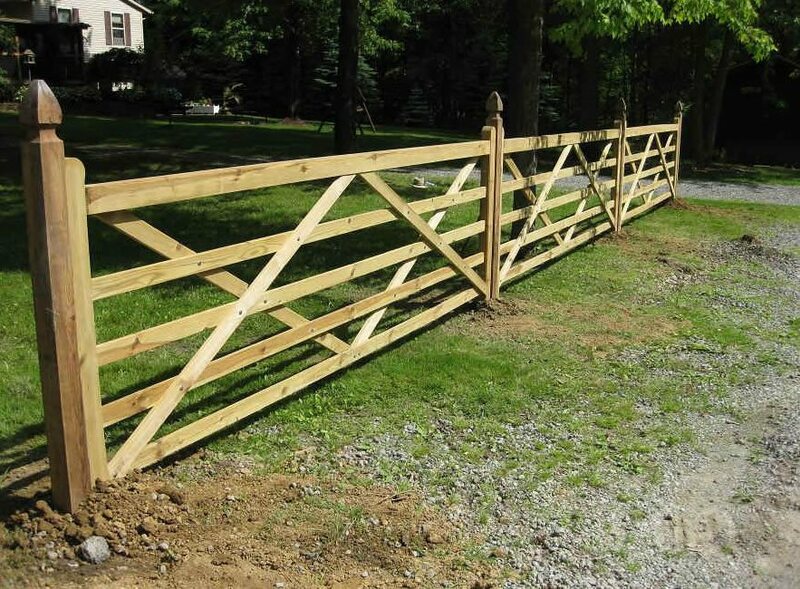 Hoover Fence claims it is the simplest of all post and rail fences to install due to the mortise and tenon connections. There is no better do it yourself project. It is available in three different sizes that relate to the heft of the rails and posts. 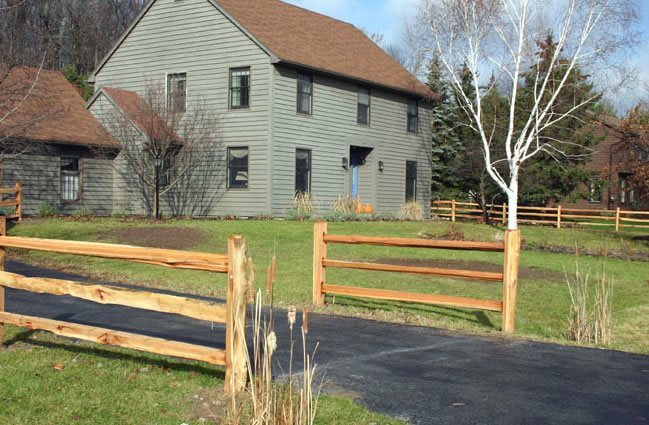 These fences are rarely treated and become more attractive over time, taking on the natural silvery coloring that blends into forest and woodland homesites like no other. This four rail high end vinyl fence manufactured by CertainTeed fence features its innovative CertaGrain texture that is much more like real wood than smooth surface designs. Strong enough to stand up to livestock, and with the additional rail it can be used for more than just horses and cattle. 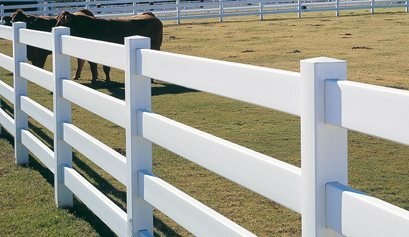 This vinyl fence is also available in a brown Sierra Blend color for ranches utilizing a more naturalistic color palette. 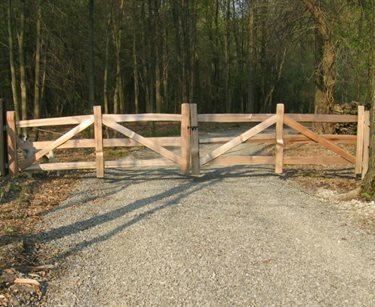 For the farm, ranch or estate seeking traditional rough entry road gate, Hoover Fence provides top quality wood gates to match their cedar split rail fences. 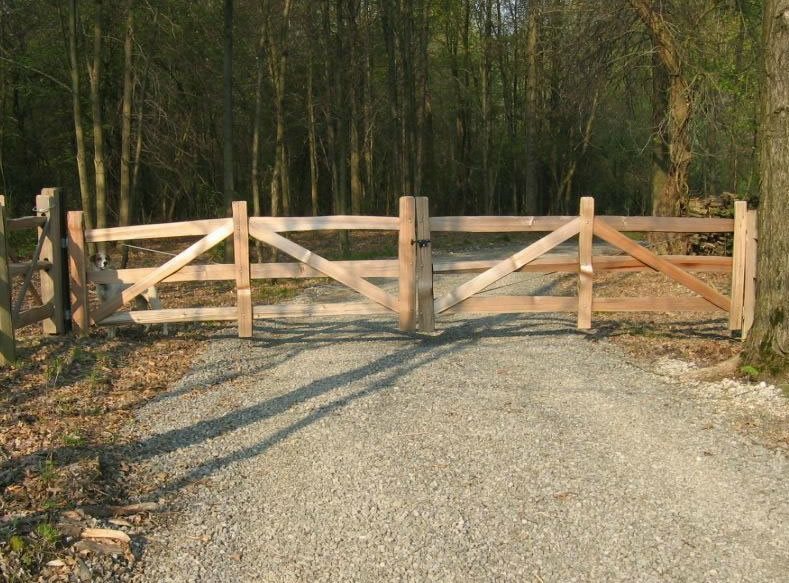 Large gates such as this which must span two lanes of traffic can be heavy and difficult to construct. 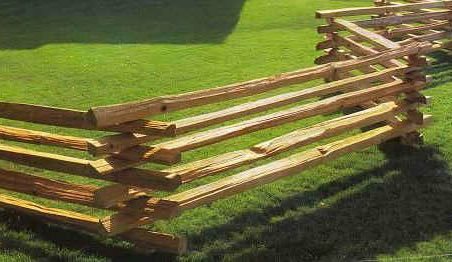 Those shipped from Hoover may be assembled on site and stained to match any wood fence system. They are also engineered to work better with automatic opening systems. 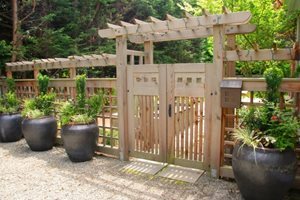 When the gate is the first thing your visitor sees when they reach your property, a well crafted beautifully designed choice is worth every penny. 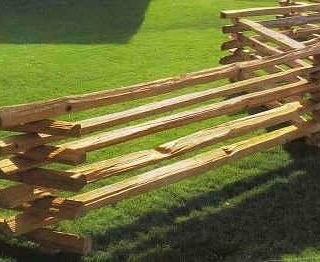 This beautiful five rail Cambridge fence offered by Hoover Fence is easy to build because each span arrives preassembled. Made of lovely light tone spruce, mortise and tenon joinery and stainless steel fasteners means it will remain beautiful for many years to come. 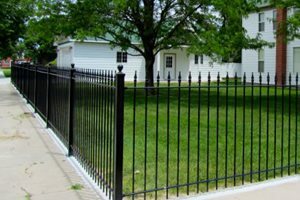 This is a fence that should be treated with stain or wood preservative to protect the surface from weathering, particularly in the north where winters or long, or in heavy rain regions. 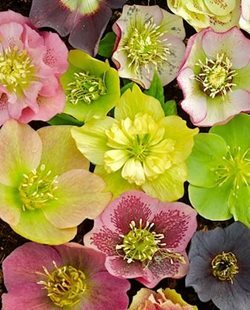 It is not recommended for livestock nor irregular terrain. But where there is no curb and gutter, this fence would make a beautiful front yard boundary.